Description: BNSF Beardstown Sub. yard limits - Empty coal train with pusher 4315 pulling in the yard. Description: The GALTUL rounds the sharp curve in downtown St. Clair, Mo. on the Cuba Sub. Description: As Metra MP36 405 heads back towards Chicago, BN 9663 and BNSF 4315 both wait to head westbound. Title: BNSF 4315, BNSF's Aurora Sub. Description: BNSF 4398 and 4315 with an interesting angle. 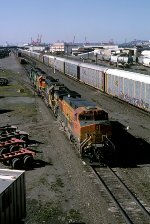 Title: BNSF 4882 Heads a oil can Sb. Description: Sb oil can train rolling past a site of a derailment 2 weeks before at mp 80 on the bnsf hannibal sub.